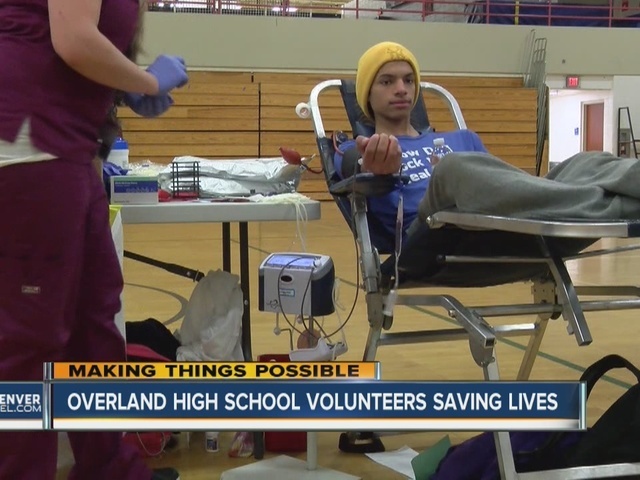 For 30 years, the senior class at Overland High School in Aurora has been hosting blood drives. All 80 of their slots were filled last week. Some of them by teachers, but many of them students. “We set up tables in the lunch room and asked people ‘are you old enough to donate? You should donate blood. You’re saving someone’s life’ and all that stuff,” senior Jessica Tran told 7news. For those high school donors, it’s the first time many of them have given blood. Organizers hope it won’t be the last. “If you can get some of those first time donors when they are 16, 17, 18-years old they are more likely to donate the rest of their lives,” said Jessica Price, a social studies teacher at the school and one of the sponsors for the senior class. Price says organizing the blood drive teaches the students responsibility, but the lessons don’t stop there. “We volunteer with families at the Ronald McDonald House who need this blood that I think makes them feel a bit more motivated,” Price added. “It’s just like the fact that I know it could save someone later,” adds senior Kelly Ho. To mark the 30th year of the Overland blood drive, Bonfils Blood Center brought cake to this year’s blood drive. Denver7 and U.S. Bank brought the student group a $500 gift card that they can use however they wish. To learn how you can give blood or organize a blood driver, visit Bonfils.org .